This course is flat but a lot of turns. The race is out and back.The course starts near the Pavillion at the heart of the Shops at Riverwoods. Runners start with silly Santa Run Warm Ups. They head West under a canopy of Christmas lights. Runners follow on to the road then on to the trail. 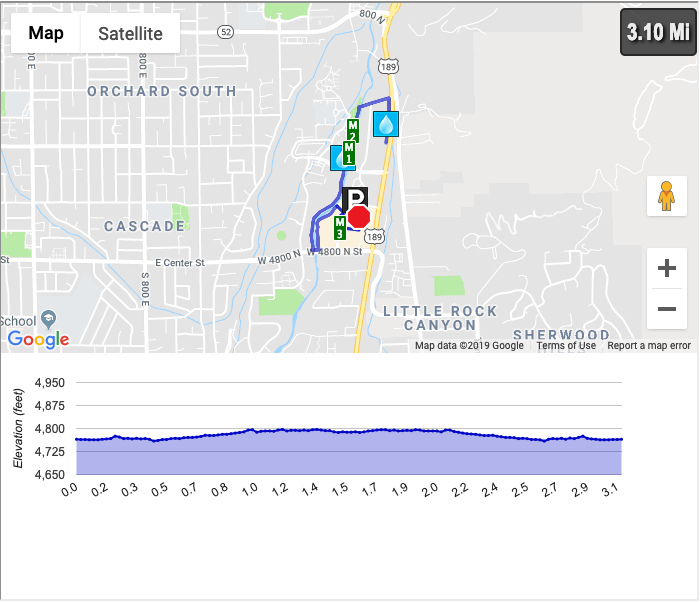 On the course there are aid stations at Mile .775, 1.55(turn around) and the same aid station for Mile .775 on the return. The aid stations are full of milk, cookies and water. The views include the Provo River, Provo Canyon to the East and the Shops at Riverwoods. Along the route all the Santa Runners will be given loads of Milk & Cookies to aid the run. Water will also be provided during these aid stations. The aid stations and the course will be supported by Elves or Santa's Helpers (Volunteers). Volunteer spots are extremely popular amoungst families because the free green shirts, hats and ears for these elves. Volunteers get a long sleeve elf shirt and hat to wear and are set out on the course. Generally they help out with aid stations or helping turn racers or helping at the finish line. We ask all volunteers to show up at 3:00PM and expect to help until 5:00PM. We ask all volunteers to show up to the Pavillion at the Shops at Riverwoods. Visit the official event page for more info. How was Utah Santa Run - Provo?